The loco is 49439 but where and any other details ? Location is Manchester London Road No.1 cabin. The flat top to the cabin was an anti-incendiary bomb protection added in the war. The caption in John Hooper’s book about Manchester London Road (Challenger Publications, 1995) gives a few more details. 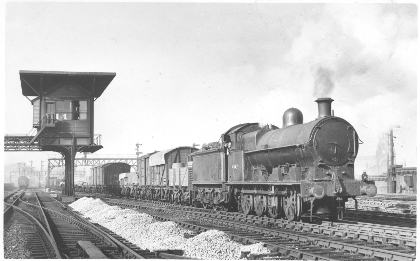 The photograph is looking north-west and was taken by B.K.B.Green on 26th February 1953. He took several others thereabouts on the same day, and on this one a part of the passenger terminus is barely visible in the left distance. The mixed freight train, estimated length 900 feet, has come from Ordsall Lane and is headed to Longsight, where 49439 was then shedded at 9A.